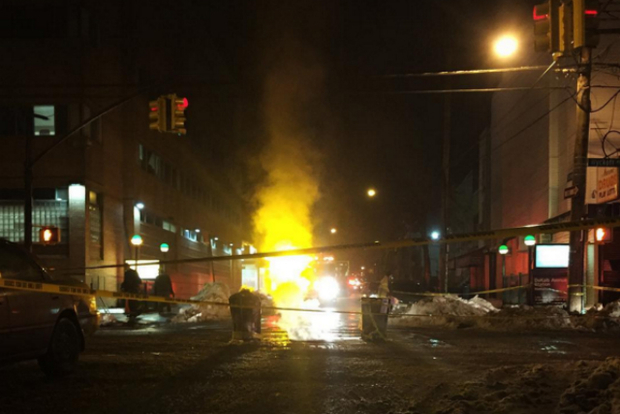 A fire flared out of a manhole on Wyckoff Avenue in Bushwick Monday night. After a blustering winter snowstorm dies down in New York City, a new threat flares up — manhole fires. The subterranean blazes, like those reported after the latest storm, are often triggered by salt that leaks into the underground electrical system and corrodes wires, which then ignite, officials told DNAinfo. "A lot of times after it snows and the snow melts, salt that is put down onto the sidewalk leaks into our system and can cause fires when it hits our equipment," said Con Ed spokesman Alfonso Quiroz. "What it does is it eats away the insulation that prevents the different cables from touching each other," said FDNY Battalion Chief Thomas Schmitt "Once that's gone, you get this effect." The flaming wiring can then release the dangerous gas, which can leak into neighboring buildings as it builds up pressure below the manhole, causing it to explode, experts said.